Sometimes there is need to install EurekaLog manually. You may need manual installation to use EurekaLog on build server without running EurekaLog installer. Or you may use manual installation to troubleshoot installation problems. If you're reading this article to solve installation issues - please read this article first. 1. Determinate name and integer version of your IDE by using this table. For example: Studio16 for name and 16 for integer version. This article will use %IDENAME% to mark name of your IDE and %VER% for integer version determinated on this step. 2. Check if you have %EUREKALOG%\Packages\%IDENAME%\ folder. If yes - skip to step 3. If no - run EurekaLog installer with /Force_D%VER% and/or /Force_C%VER% command-line switches. 3. Copy EurekaLogCore%VER%0.bpl, .dbg, .jdbg files from %EUREKALOG%\Packages\%IDENAME%\ folder to 32-bit Windows\System32 folder. It is a run-time package (EurekaLogCore). This file will be used by IDE in steps 7 and 9 below. 5. Go to Components/Install packages menu item of your IDE. 6. Find any EurekaLog packages in the list. Remove them (if present). 7. Click on "Add" button and pick up %EUREKALOG%\Packages\%IDENAME%\EurekaLogExpert%VER%0.bpl file. 8. Make sure that "EurekaLog IDE Expert" appears in package list and it has checkbox checked. 9. Click on "Add" button and pick up %EUREKALOG%\Packages\%IDENAME%\EurekaLogComponent%VER%0.bpl file. 10. 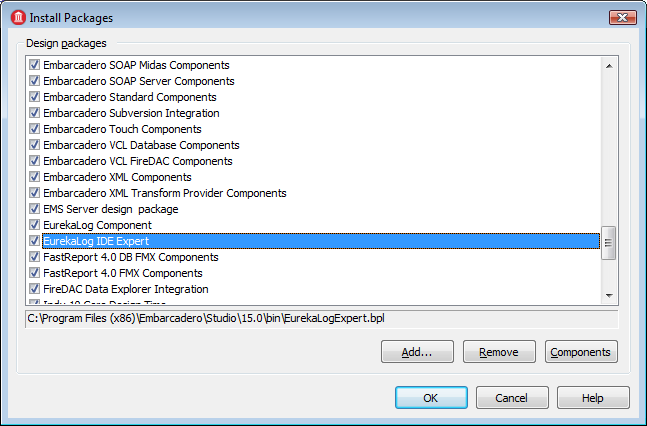 Make sure that "EurekaLog Component" appears in package list and it has checkbox checked. Now you should be able to see EurekaLog IDE menu items. There also should be TEurekaLogEvents component present on "EurekaLog" tab in component palette. Note: all installed components and extensions are limited by limitations of 32-bit processes. If your IDE crash after installing and/or using EurekaLog IDE expert - try to remove unused components/extensions. 12. 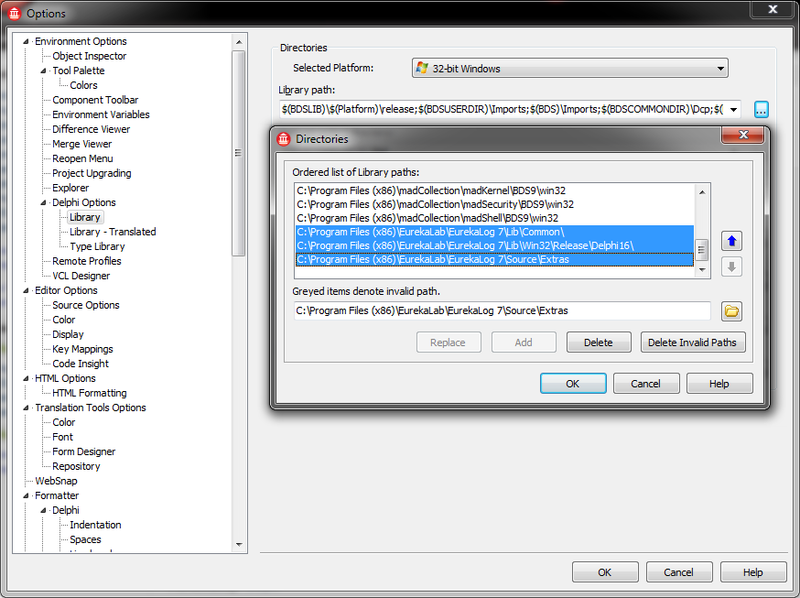 Go to Tools/Options menu item of your IDE (some IDE versions names this menu item as "Environment options"). 13. Find Library category in options dialog (it should be a tab for old IDE versions or tree view item for new IDE versions). For C++ Builder as part of RAD Studio - look for C++ Options/Paths category. 14. Find "Library Search Paths" options (other possible name is "Library path"). 15. Click on "..." button to open list of library search paths. 16. Remove all EurekaLog-related paths (if any present). 17. Add %EUREKALOG%\Lib\Win32\Release\%IDENAME%\, %EUREKALOG%\Lib\Common and %EUREKALOG%\Source\Extras\ folders. Now you should be able to compile your projects. 18. (Optional, Delphi XE2+ only) Change platform to "64-bit Windows" and repeat steps 12-14, only use Win64 instead of Win32 folder. Note: search paths may be limited in length. If your changes aren't working - please remove unused paths or move EurekaLog towards the beginning of the list. 19. Find "Browsing path" option in the same dialog. 20. Click on "..." button to open list of source browsing paths. 21. Remove all EurekaLog-related paths (if any present). 23. (Optional) Add all subfolders of %EUREKALOG%\Source\ folder. 21. (Optional, Delphi XE2+) Change platform to "64-bit Windows" and repeat steps 17-20. 24. Find "Debug DCU paths" option. 25. Click on "..." button to open list of debug paths. 26. Remove all EurekaLog-related paths (if any present). Now you will be able to use 2 sets of files (debug/release). 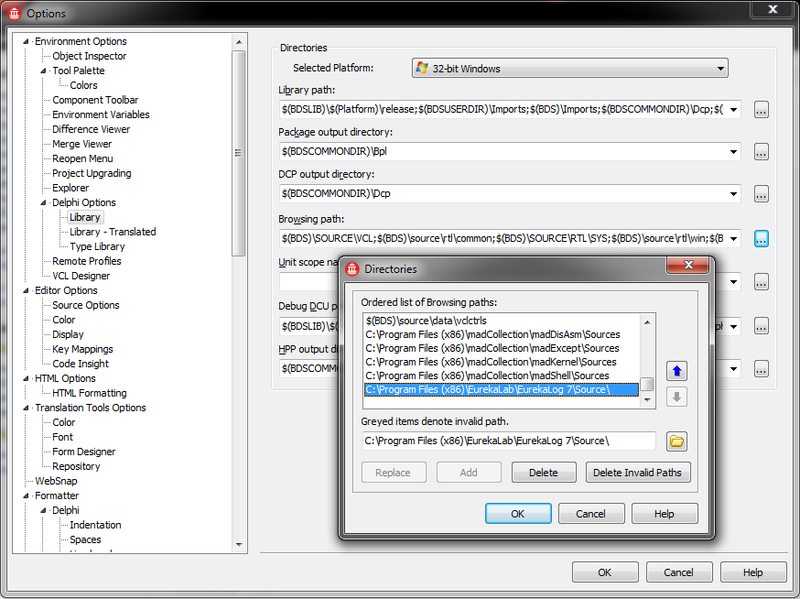 When you enable "Use Debug DCUs" option - files from Debug folder will be used. 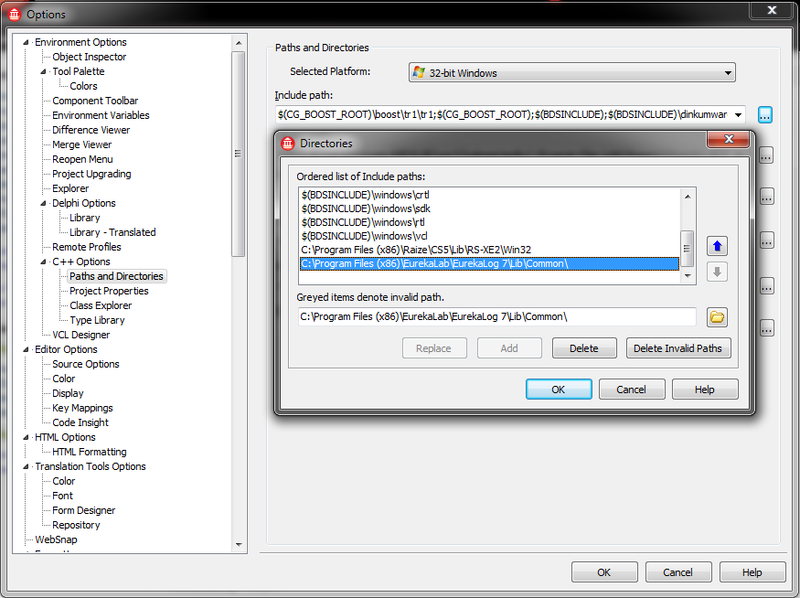 Otherwise ("Use Debug DCUs" option unchecked) - Release folder will be used. 28. (Optional, Delphi XE2+) Change platform to "64-bit Windows" and repeat steps 23-25. 29. Find "Include paths" option. 30. Click on "..." button to open list of include paths. 31. Remove all EurekaLog-related paths (if any present). 33. (Optional, Delphi XE2+) Change platform to "64-bit Windows" and repeat steps 26-28. 35. Make sure IDE expert is not disabled for this project - go to Components/Install packages menu item and make sure EurekaLog Expert package is present and enabled. 36. Check project options (Project/Options) - make sure there are no EurekaLog paths listed in any options. 37. Delete all .dcu/.obj files of your project. Make a full build.